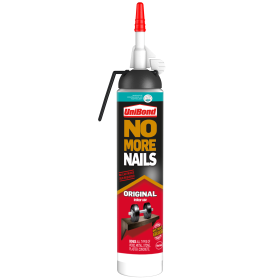 Henkel says UniBond No More Nails Original can fix virtually anything. It does away with the need for nails and screws when fixing many things in and around the home such as skirting board, architrave, and other timber mouldings. It comes in a tube, cartridge or easy pulse format to suit the job. The tube is great for small jobs, for larger jobs use the traditional cartridge for use with a gun or if users do not have a gun the new ‘easy pulse’ is very handy. With an easy pulse the product, a piston, and compressed air is in the can and an easy to use trigger is pressed to dispense the product – ideal when you don’t have a cartridge gun or you have difficult to reach applications. And right now, No More Nails has been launched in an all-new ‘click & fix’ dispenser for small applications and light DIYers.